Peter Dale Scott's meticulously documented investigation uncovers the secrets surrounding John F. Kennedy's assassination. Offering a wholly new perspective—that JFK's death was not just an isolated case, but rather a symptom of hidden processes—Scott examines the deep politics of early 1960s American international and domestic policies. Scott offers a disturbing analysis of the events surrounding Kennedy's death, and of the "structural defects" within the American government that allowed such a crime to occur and to go unpunished. In nuanced readings of both previously examined and newly available materials, he finds ample reason to doubt the prevailing interpretations of the assassination. He questions the lone assassin theory and the investigations undertaken by the House Committee on Assassinations, and unearths new connections between Oswald, Ruby, and corporate and law enforcement forces. Revisiting the controversy popularized in Oliver Stone's movie JFK, Scott probes the link between Kennedy's assassination and the escalation of the U.S. commitment in Vietnam that followed two days later. He contends that Kennedy's plans to withdraw troops from Vietnam—offensive to a powerful anti-Kennedy military and political coalition—were secretly annulled when Johnson came to power. The split between JFK and his Joint Chiefs of Staff, and the collaboration between Army Intelligence and the Dallas Police in 1963, are two of the several missing pieces Scott adds to the puzzle of who killed Kennedy and why. Scott presses for a new investigation of the Kennedy assassination, not as an external conspiracy but as a power shift within the subterranean world of American politics. 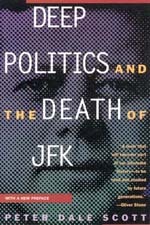 Deep Politics and the Death of JFK shatters our notions of one of the central events of the twentieth century. Peter Dale Scott is a Lannan Literary Award-winning poet and Professor of English at the University of California, Berkeley. He is also coauthor (with Jonathan Marshall) of Cocaine Politics: Drugs, Armies, and the CIA in Central America (California, 1991), among other books.